By the way… it is NOT a necessary result that your knees be at risk after a sprained ankle. This is simply a consequence of NOT adequately rehabilitating the ankle after an injury. 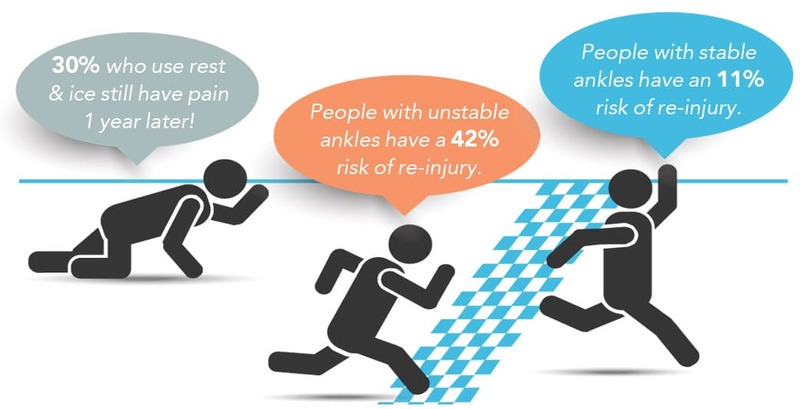 If the ankle stays weak, unstable with a poor range of motion, you will be putting the knees at risk and that can be far more serious than the sprained ankle itself. So, let’s get into the why… After a sprained ankle, there is a great deal of damage to the ligaments. They weaken a lot and stiffen up tremendously. While rest is an important component of any healing process, too much rest can lead to stiffness and weakness in the ankle joint for life! In other words, the ligaments never fully regain their natural strength or stability. Several new studies in people and animals suggest that a single sprained ankle can alter how well and often you move for LIFE. In one study, students with chronic ankle instability moved significantly less than the other students, taking about 2,000 fewer steps on average each day. Now, if the ankle stays stiff and weak, it is critical to understand the following point: The ankle is a very MOBILE joint. It HAS to be mobile. Now, the next joint up the chain of the body is the knee. Please, understand the following point: The knee is a STABLE joint. That means it is NOT supposed to move. AND HERE IS THE BIGGIE: If the ankle cannot move properly, the knee WILL move instead. And that is bad… very bad. The ACL or MCL will most likely tear. So, all these ankle braces and tape and wraps, etc. which are supposed to protect the ankle (by immobilizing it) just expose the knee to serious injury. And even without ankle braces, a stiff, unstable, weak ankle will be much less mobile, which means the knee will have to compensate and can tear without a lot of pressure. Now, a knee tear is a much more serious injury than a sprained ankle. As you know, that can change an athlete’s entire career. Or it can cause the average person a whole year of pain and a lot of money. But, I am telling you that, for the most part, these knee injuries can be dramatically reduced or avoided altogether by properly rehabilitating the ankle after an injury. So, instead of rushing back or waiting around using R.I.C.E. 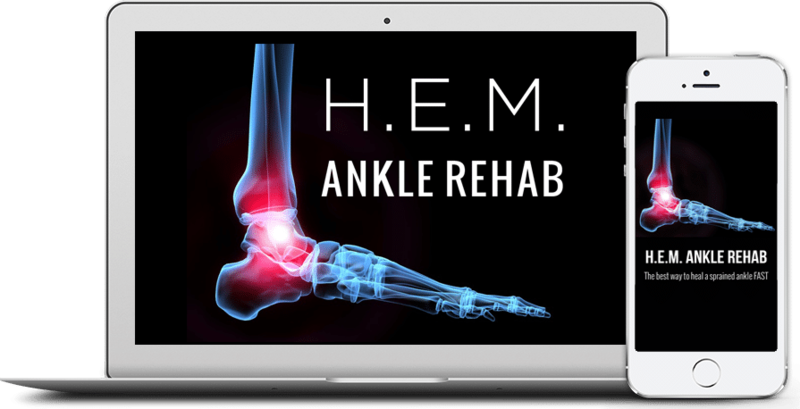 (rest, ice, compression, elevation) and hoping your ankle heals (it won’t), you need to take an active role in the healing process AND make sure you give your ankle enough time to FULLY heal. That means proper rehab AND prehab with a top quality sprained ankle treatment. You can go see an excellent physical therapist or you can use H.E.M. Ankle Rehab at home. If you take a little time to properly heal the ankle, you will have full range of motion, and a strong stable ankle. It means your ankles will NOT be weak, stiff and unstable, putting your knees at risk of tearing. It also means you will NOT need ankle braces or other inhibiting equipment that further puts your knees at risk. In addition, you will have strong, stable ankles that can actually IMPROVE overall athletic performance and overall quality of life. You can expect improved balance, lateral speed and quickness. 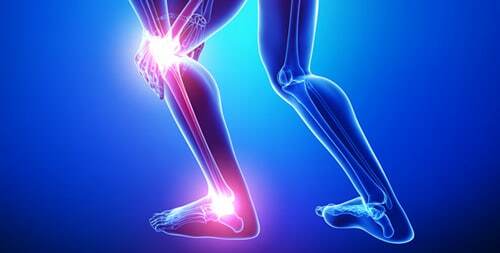 A sprained ankle and knee pain go hand in hand if not treated properly. But, a sprained ankle that heals correctly puts you at a lower risk of a knee injury and improves your overall athletic performance significantly. So, take a little extra time and heal your body the right way. It will pay huge dividends in the short term and in the long term.